You are here: Home / 2010 / January / What could the Apple Tablet do for the iPhone? A MEDIA HUB OR JUST AN EXTENDER? On the iPod Touch, the iPod app is further broken down into separate “Music” and “Video” apps. Also consider the Apple TV, which has the effective functionality of the iPod and iTunes Store apps on the iPhone, plus it can act as an AirTunes receiver. SO HOW COULD WE USE THIS TABLET FOR MEDIA? 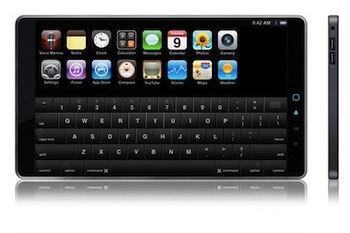 The Apple TV could be a good pointer. Over the local network, it can play shared iTunes media, and sync (whole or subsets of) iTunes libraries stored on other computers. You would expect to do more on a Tablet, as it’s more like having a desktop. 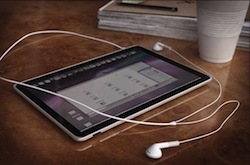 So iTunes on the Tablet could include music management, such as creating and altering playlists. This sort of functionality is not currently available on the iPhone, except in a limited way with Genius playlists. Some of this *is* available, however, with the iPhone’s Remote app: you can delete songs from playlists or playlists themselves, and add tracks to the iTunes DJ playlist, but that’s about it. I’d like to see this extended, so that you can manage playlists for media stored on the Tablet itself (and have those changes synced back to desktop iTunes clients). I’d also like to have music management built in to a Tablet Remote app, so that you can alter playlists on remote computers, and use it to control streaming to an Airport Express, Apple TV – and maybe even the Tablet itself. Let’s not forget iPhoto. My iPhoto library is too big for my wife’s old iBook laptop, so she uses her own iPhoto store, and has access to a copy of our full photos via a shared copy on my iMac server. Which I have to keep merged, which involves a lot of manual fiddling. Uh. Apple need a way to make managing syncing and subsets of photos easier as well. And they already have it: iTunes Home Sharing. It would be a very good way of getting photos on the Tablet, and allow for syncing back to a central store. Bonus points: allow that central store to be on a Time Capsule. All this could point to a more comprehensive ability to sync wirelessly – more than just contacts, calendars and email at the moment. Maybe with an API for developers? Right now, I have to sync all my iPhone apps separately, which is a pain. I’d love to be able to sync them all at once. All of media features I’ve looked at could be included in iPhone OS 4.0 on an Apple Tablet. But what does this mean for the iPhone itself? The next revision of the iPhone will certainly have more storage and probably fast 802.11n wireless networking – making it suitable for all of the above functionality. Apple excels in making media accessible to users, and I’d like to see a Tablet that’s both excellent as a standalone device, and also complements the setup that I already have. Through all the rumour over the past months, I’ve not been able to shake off the idea that it’s basically just a big iPhone and as I wouldn’t be able to put that in my pocket or easily use it in one hand, I’m left wondering what I would use it for and why it would be better than my iPod Touch. Ok, playing videos would be a bit easier to watch and games a little nicer looking (assuming the graphics didn’t break down at the larger size) but other than that… ? Having said that, I’ve no doubt that Apple will surprise me with enough goodies and functionality that will make it droolworthy and have us all gagging to get our hands on one. For what it’s worth, here’s my prediction… pressure sensitivity (or pseudo pressure sensitivity) – all the better to paint and draw with.